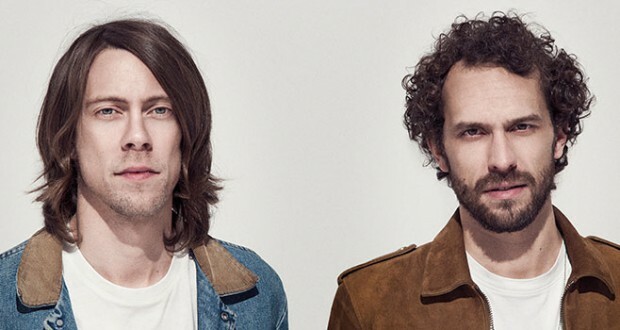 Their name may conjure up images of sun-glazed beachgoers and ice-cold rum, but it’s fair to say that Parisian indie-rock duo Jamaica share few musical similarities with their Caribbean counterpart. Fortunately (the odd legal difficulty aside), the band haven’t had to worry too much about people confusing the two. In fact, with Ventura (the follow-up to their critically acclaimed debut No Problem) the pair deftly combine a wealth of 80s musical influences with their latent obsession with American culture, to produce an album that isn’t so much dancehall as ‘Dancing on the Ceiling’. We sat down to talk to the pair (Antoine Hilaire and Flo Lyonnet) as they made their final preparations before the album’s release, and it’s fair to say that they were pretty excited about the whole thing. “It’s the little brother. It’s probably better at school, taller, and will probably make more friends than the eldest. It dresses better as well. It took all the advantages of its big brother, but enhanced them. It’s spoiled. We put more money into it than the first one!” It’s a pretty good metaphor; while No Problem was undoubtedly a great album, it feels like, this time around, the band have been able to explore their sound more coherently, resulting in an album that feels like a solid, indie-rock unit, and yet which possesses just the right amount of diversity to ensure that every track has something new to recommend it. Lead single ‘Two On Two’, one of the first songs previewed from the album, is typically energetic, and kicks the album off nicely. “It seemed like a really enthusiastic opener for the record. The other songs are rockier, or bigger in an emotional sense, so it seemed like a good entrance into the record. And it talks about believing an album as well, so we thought it was clever.” Many tracks follow in a similar vein, but that wasn’t all that the pair wanted to achieve with Ventura. In fact, in ‘Turbo’ the album includes their first instrumental release. “We wanted a pure instrumental song for once, just to give it a try. When it comes to making an instrumental you have a different way of envisioning them. The brutal one, the really heavy track, seemed like a good route to us, because Flo is really into heavy metal, and I like the genre as well. It’s not like paying homage, because it’s more than that; it’s more like surf music as well. But there’s more to it than tongue-in-cheek-lyrics or riffs. It’s a bit more sophisticated than that. We wanted to show this aspect of our work.” It’s a unique inclusion on the album, and while it’s frustrating that there’s not a vocal melody to sing along with, it’s an exciting, almost shocking listen in comparison to the relatively gentler indie rock that sits either side. Peter Franco, whose previous credits include Daft Punk’s Random Access Memories and Jamaica’s early single ‘I Think I Like U 2’, worked with the band during their recent stint in the US, where they holed themselves away deep in the San Fernando valley. “We were in a house, we were in a mobile studio in the living room, with a room to do the master control. It was really, really different because every time we would wake up and go to the gear and play and people couldn’t hear us. A normal day meant getting up, playing guitar and bass and thinking about the lyrics all day. It was really natural.” First working out of a house on Ventura Boulevard (hence the album title), the pair then returned to Paris to finalise the mix on the album, a move that wasn’t without its difficulties. “We tried to find the same rhythm when we went back to Paris to Tranquille Le Chat, the studio where we finished the record. From the song-writing to finishing the album, we tried to have office hours, and that was pretty interesting to work like that, because the first album was made during night time, most of the time. It was more chaotic.” Fortunately, under the watchful eye of Laurent D’Herbécourt (“Any band should have a try with him. He’s a bit grumpy, but he’s pretty cool”), they got it done, and done very, very well. While the Mongolian Steppes may seem a bit of a leap from the Californian desert, you probably wouldn’t put it past this lively pair. If you want to hear them before they lock themselves away in Khan country, then you can catch their only confirmed UK show on May 16th at the Oslo, London.